The strange disappearance of Malaysia Airlines Flight 370 from airspace in the last week has caused international concern, and adds an additional anxiety for those already afraid to fly. Recently, some airports have even decided to tackle the fear of flying first hand, offering classes on handling various plane related fears like claustrophobia and turbulence. 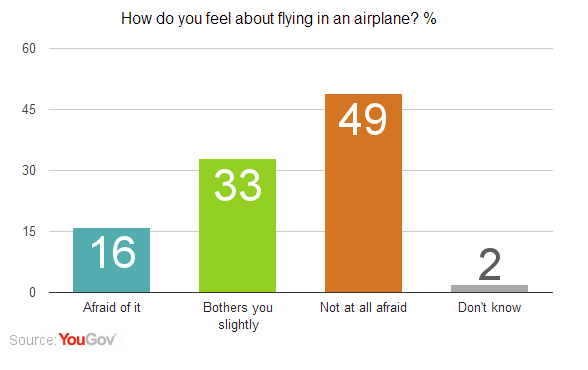 According to the latest YouGov research, a third of people (33%) are slightly uncomfortable flying in an airplane, while 16% are actually afraid of it. Women (38%) and people older than 65 (41%), are more likely to be bothered on flights than the wider public. Nearly half of Americans (49%) have no problem flying whatsoever. Many people (47%) think that it is safer to fly rather than drive for long distance trips, which is backed up by the statistics. Per trip, you&apos;re 72 times more likely to die in a car than on a plane. 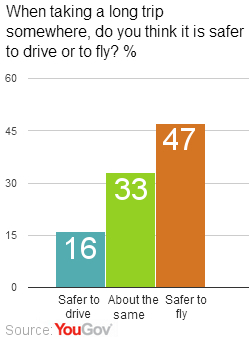 Despite this, 16% of Americans do think that it&apos;s actually safer to drive than fly. It it interesting to note that while older people are more likely to be uncomfortable flying, they are much more likely to think that it is safer to fly than drive (56%), while women are less likely to say it&apos;s safer (40%). When people were asked whether or not they would be willing to go through longer and more intrusive bag checks and passenger searches in order to improve airport and airline security, 46% of people said they would be willing, while 38% said they would not be.